It seems much as changed since Private Island News reported on Greek tourism minister Pavlos Geroulanos’ point blank refusal to place any of his country’s islands up for sale. With no end in sight for the beleaguered country’s fiscal problems, Greek officials have been forced to place the picturesque island of Elafonisos up for sale. Located towards the southern tip of the Peloppenese, 175 acres of Elafonisos’ pristine public beaches, Sarakiniko and Simos, look set to be sold as part of a privatization plan organized by the Hellenic Republic Asset Development Fund (TAIPED) and announced earlier this week. 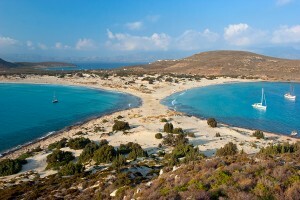 The decision to sell off the beaches – which were voted amongst Greece’s best by British newspaper The Guardian earlier this year – looks certain to enrage locals and international environmental organizations alike, who claim that the sale of the island could jeopardize Elafonisos’ fragile environment. Whilst the sale of the beaches is – in line with Article 14 of Law 3986/2011- set to be limited to a 50 year-long leasehold, the construction of a hotel or similar vacation development is permissible, provided the country’s strict environmental and legal guidelines are adhered to. But is this really enough to prevent the island’s exploitation? Currently under the protection of the European-wide Natura 2000 program, Elafonisos forms part of a specially protected ecological network, and has already been singled out for special consideration by scientists due to the endemic fauna that exist on the island’s beaches and count amongst the Mediterranean’s 50 most endangered plants. At the forefront of the growing wave of discontent is Elafonisos’ mayor, Panagiotis Psaromatis, who has expressed his anger at the decision in a frankly worded letter to both the President of TAIPED and Greece’s independent Minister of Finance, Yiannis Stournaras. Stay tuned to Private Island News for the latest developments surrounding the sale of Elafonisos and head over to our social media pages (Facebook, Twitter and Google Plus) to have your say – is the Greek government right to put its islands up for sale?